Sri Lanka has been a multilingual society from the very beginning of its history. There were, at least, ten languages in use from time to time. For that matter, the Sinhala language itself is the product of multilingualism. It came into being six centuries before the dawn of the Common Era, in our Island kingdom, by the amalgam of, at least, six different languages. What were these languages? The language used by Prince Vijaya and his seven-hundred followers who came from Vanga. It was a language that belonged to the Indo-Aryan sub-family of the larger Indo-European family. In the course of time, it gave birth to Modern Bengali and Bangla. The language used by Princess Kuveni whom Vijaya married. She was a princess of an ethnic group known as the Yakkha. She bore two children, a son and a daughter, and they grew up in a bilingual family, where the father spoke Vanga and the mother spoke the language of the Yakkhas. The language used by the maidens sent from the city of Southern Madura in India. According to our chronicles, Prince Vijaya was requested to marry a maiden of the ksatriya caste and messengers were sent to the city of Southern Madura in India seeking the daughter of the king of Pandus. Seven hundred young maiden were also sent from Madura to be married to Vijaya’s followers. All these families were also bilingual, because husbands spoke Vanga and their wives spoke the language spoken in Madura. The language used by the ethnic group known as the Rakkhasas, who were considered descendants of King Ravana, the king of Lanka who defeated the Indian king, Rama, as narrated in the Indian epic, Ramayana. The language used by the ethnic group known as the Nagas. Our chronicles record that the Buddha visited the Island to settle a dispute between two Naga kings, Culodaraand Mahodara. With the introduction of Buddhism in the third century BCE, another Indian language was introduced to the Island. It was called Pali or Magadhi. It was the sacred language of the Buddhists. The Buddha delivered his sermons in Magadhi, the spoken language of the Indian state of Magadha, and Sinhalese monks were well versed in Magadhi, which had by then become the lingua franca of the Buddhist world. In fact, the word of the Buddha was committed to writing for the first time in Sri Lanka in the first century BCE. Buddhist monks used the Sinhala alphabet to write Magadhi. Pali was used to write commentaries on the Buddha’s word, and to compose epics and chronicles. The two main chronicles, Dipavamsa (Island Chronicle) and Mahavamsa (Great Chronicle) were written in Pali. Even today Pali is used in all religious rites and rituals in Buddhist temples, in naming Buddhist monks and in naming Buddhist temples. Even during the last days of the Island kingdom, Sinhala Buddhist monks were bilingual, for they used Pali when they communicated with Buddhist monks in Myanmar or Thailand. The lingua franca of Mahayana Buddhists. While monks of the Mahavihara, the main Theravada monastery at Anuradhapura, the first royal capital of this kingdom, used Pali as their lingua franca, the monks of the Abhayagiri monastery, a centre of Mahayana used Sanskrit. In the fifth century, the Sinhalese king, Kumaradasa, composed an epic poem in Sanskrit, known as ‘Janakiharana’ based on the story of Sita (also known as Janaki) as narrated in the Indian epic poem, Ramayana. King Sena I, who lived in the eighth century, translated the Sanskrit work on poetics, ‘Kavyadarsha’ of Dandin, into Sinhala verse and called it ‘Siyabas Alankaraya’. Prakrit was another Indo-Aryan language studied by Sinhala scholars. It was among the six languages (shad bhasha) that were studied by Sinhala scholars, the others being Sanskrit, Maghadhi, Apabhransha, Paisachi and Sauraseni. Tamil, spoken both in India and Sri Lanka, was is use from the earliest times. The island was ruled by many Tamil (Damila) kings, from time to time, beginning from Sena and Guttika, in the second century BCE. The Mahavamsa records this episode thus: “Two very powerful Damilas, Sena and Guttika, sons of a horse-shipper, seized Suratissa, the ruler of the earth, and the two of them reigned twenty-two years, justly” (Ch. 21, v.10-11) Ten years later, another Damila king, Elara, came into power and ruled the Island for forty-four years. He was considered one of the most righteous kings who ruled our country. In the sixteenth century, Tamil was considered on par with Pali and Sanskrit. Tamil spoken in Sri Lanka, however, is different from Tamil spoken in Tamil Nadu in India. Portuguese was the first European language that came into contact with Sinhala and Tamil. The Portuguese introduced not only their language but also their religion, the Roman Catholic religion. The Portuguese were followed by the Hollanders, who spoke Dutch. During their period many words relating to the Roman-Dutch law came into the Sinhala lexicon. English became the official language of the country since 1815 when the Island became a crown colony of the British Empire. It remained so until 1956 when English was replaced by Sinhala. The impact of English was two-fold: First, it left behind a brand of English known as ‘Sri Lankan English’. Second, it produced a brand of Sinhala, known as ‘Singirisi’, which uses English words in Sinhala structures. 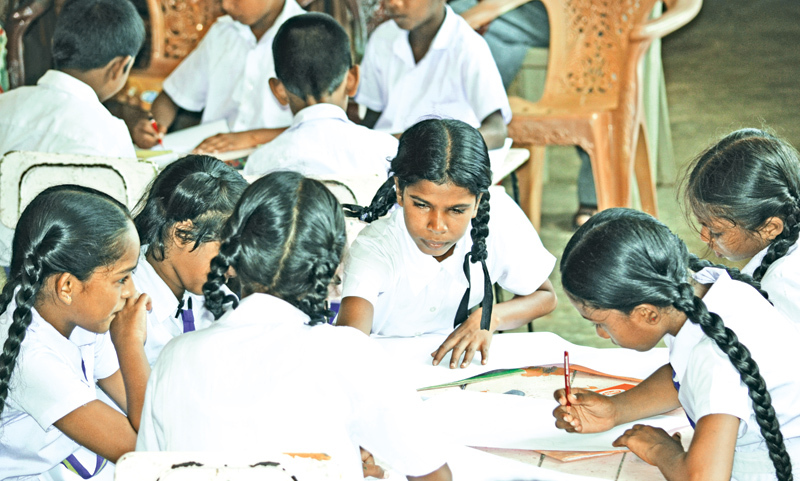 Even though Sinhala and Tamil, collectively known as ‘swabhasha’ (one’s own language or mother language) were made the medium of education, the Tamils were unhappy that their mother language was not given the same official status that was given to Sinhala. This naturally led to political problems, which ultimately ended in a struggle for a separate state. After many years of terrorist war, the mistake was remedied, making Tamil also an official language. Today, English serves as a link language, that brings the two ethnic groups together, until they learn Sinhala and Tamil as second languages. Bangladesh had to face a somewhat similar experience. As Professor Emeritus Afia Dilsays, “The Bengali Muslim leaders had convened and established the Muslim League as a socio-political organization in Dhaka in 1906 to safeguard the interests of the Muslim community. This political party played a leading role in awakening the Muslims throughout India, leading to the Pakistan Movement in 1940, and as a result, the region became East Pakistan province of Pakistan as an independent nation-state in 1947. Sri Lanka is now in the process of building a new nation where all ethnic groups, the Sinhalese, the Tamils, the Muslims and the Burghers, can live in peace, harmony and integrity. In order to achieve national development, steps have been taken by many institutions to build national unity through mutual understanding among speakers of different languages. Accordingly, a Presidential initiative for a Trilingual Sri Lanka has been launched with a view to spread the competence of the two national languages, Sinhala and Tamil, and the link language, English, among the communities at large. The task of implementing this programme is in the hands of several ministries, departments and commissions. Among the ministries, the most important is the Ministry of National Co-existence, Dialogue and Official Languages. The compilation of text-books, trilingual dictionaries and glossaries of technical words is in the hands of the Department of Official Languages. Complaints regarding the implementation of the Official Language Policy are handled by the Official Language Commission.